There is far too much complexity when it comes to picking the best stocks to buy. I call it the information overload trap. There are literally thousands of stocks available to trade, but often it's hard to determine which ones will be profitable. 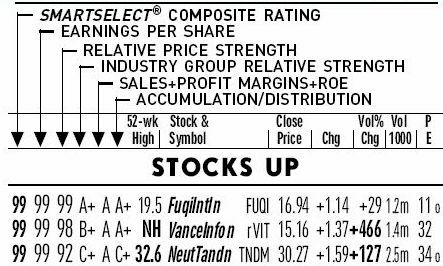 I used to be frustrated with my inability to choose good stocks, but now I pick the best stocks to buy with ease because I follow a proven system created by William J. O'Neil. It has for years achieved phenomenal results. It's a rather simple process, but it produces stock market picks that produce above average returns. Up until now it's been my closely guarded secret, but I do believe all good things are meant to be shared so I am making my stock picking process available to the general public. Spotting the best stock to buy (quality stocks) is a hard skill to develop, but the formula below makes the process easier. Again, this is not my system. It was created by a guy named William J O'Neil. The founder of the Investor's Business Daily (IBD) (link). My summary of the strategy is that you trade strong stocks and avoid weak ones. And strong is determined by the stock making an all-time new high. "C – Current quarterly earnings per share have increased sharply from the same quarters' earnings reported in the prior year (at least 25%). A – Annual earnings increases at a compound rate of no less than 25% (P/E is unimportant – probably in the range of 20 to 45 with these stocks) annually over the last five years. N – New products, new management, and new highs. Stocks with a good "story." S – Supply and demand. The less stock available, the more buying will drive up the price. Look for stocks with 10 to 12 million shares outstanding. L – Leaders and laggards. Stick with those stocks that outperform and shed those that underperform. M – Market direction. Buy stocks on major downturns, but avoid purchases after a decline of 10% or more gets underway." The Investor's Business Daily newspaper does most of the work you. They will do the analysis of the stocks and then rank them by the above criteria. Then I simply go in and find the top rated stocks that also have options available to trade. As I said earlier, it's a rather simple process, but it produces stock market picks that produce above average returns. If you don't want to pay for a subscription to the IBD newspaper then you can use MarketClub's FREE stock list (I use that also). Below is a walk through of the MarketClub process.